In recent calculator overclocking tournaments, some programs took over more than a few minutes to finish. In extreme cases, programs run over an hour. The size of data set of these long running calculations are not realistic in most cases for hand held calculators, but for the sake of overclocking comparison, they are attempted to obtain the time required. The back-light of the Nspire will be on for the whole period running the benchmark calculation. When the program is finished, the back-light will turn off after a predefined period, which is a user configurable setting. An LED will act as an light sensing diode, and is placed on top of the Nspire screen. The voltage will be measured by the LaunchPad, and send periodically through the 703N router to Exosite. From repeated testing the difference in voltage when the back-light is on and off are determined. This make it possible to set an alarm on Exosite with that known threshold. The time to start the calculation is recorded manually. After starting, the task of taking the finish time will be taken care of by the Exosite alarm timestamp, as triggered by the drop in voltage detected from the turning off of the back-light. Best result of the LED threshold is obtained when working in the evening and lights are turned off. Although the time taken is not as accurate as taken manually by stopwatch due to the delay between measuring of consecutive LED voltage (set as around 4 seconds to avoid flooding Exosite), it should be good enough for long running calculations that span a quarter to more than an hour. Better methods for timing may exists (e.g. internal timers on the Nspire itself) but this improvised one with simple devices and a free cloud service worked quite well, for the best part is automation so that I no longer have to look out from time to time to check if the calculation is finished. 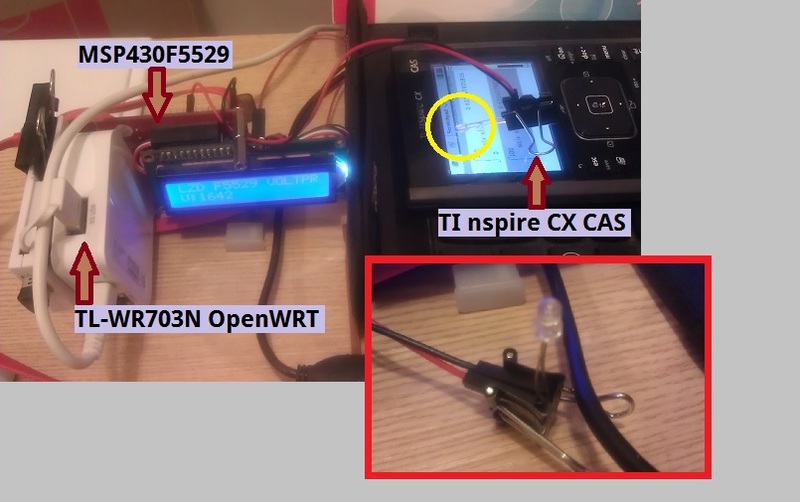 This entry was posted in LaunchPad, MSP430, OpenWRT, TI Nspire CX CAS and tagged calculator performance, Exosite, MSP430F5529, TL-NR703N on May 2, 2015 by gmgolem.